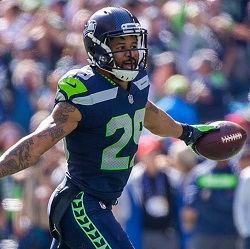 This past NFL offseason, Earl Thomas and the Seattle Seahawks engaged in a contract dispute that spilled into training camp, engulfed the preseason, and threatened to overshadow the team’s regular season. For weeks, the All-Pro free safety was absent from the team that needs him to even have a shot at the playoffs. But then Thomas essentially popped up of nowhere for Week 1 of the regular season, and since then he’s played like he is immune to these so-called “distractions.” That included missing two practices this past week for reported “personal reasons,” which was of great interest to the local and national media. Thomas intercepted a pass in Seattle’s opener, and on Sunday he recorded two interceptions and seven tackles in the Seahawks’ 24-13 victory over the Dallas Cowboys. The Seahawks were in what felt like a must-win game in their home opener after starting the season 0-2 with losses to the Denver Broncos and Chicago Bears on the road. Most would agree that Seattle’s offense was more to blame in those losses than the defense, but it’s not like the defense had no room for improvement. On Sunday, Thomas led the way by making a tough shoe-string catch on a first-quarter interception of QB Dak Prescott, and then picking off his second late in the fourth quarter. Watching him celebrate that play by bowing toward the Cowboys’ sideline, you’d never know that this was an athlete and a team that is supposed to be consumed by distractions. Caden Sterns, S, Texas (NCAA) — The freshman had two interceptions and five tackles in the Longhorns’ 31-16 upset win over 17th-ranked TCU. Terrance Mitchell, CB, Browns (NFL) — His interception with 11 seconds left clinched Cleveland’s first victory since 2016, a 21-17 win over the New York Jets on Thursday that had a playoff-like atmosphere in a city that deserved to celebrate like it had won a championship. Parnell Motley, CB, Oklahoma (NCAA) — The fifth-ranked Sooners survived an upset bid by Army on Saturday when Motley snagged an interception on fourth down in overtime to secure Oklahoma’s 28-21 victory. Donte Jackson, CB, Panthers (NFL) — The rookie out of LSU, considered probably the fastest player in the 2018 NFL Draft class, had his best game as a pro so far with two interceptions and seven tackles in Carolina’s 31-21 victory over the Cincinnati Bengals on Sunday. Paulson Adebo, CB, Stanford (NCAA) — The sophomore had six tackles and four pass breakups in the 7th-ranked Cardinal’s 38-31 victory over 20th-ranked Oregon on Saturday. His biggest play was a textbook deflection in the end zone during overtime that prevented a potential game-tying score for Oregon. 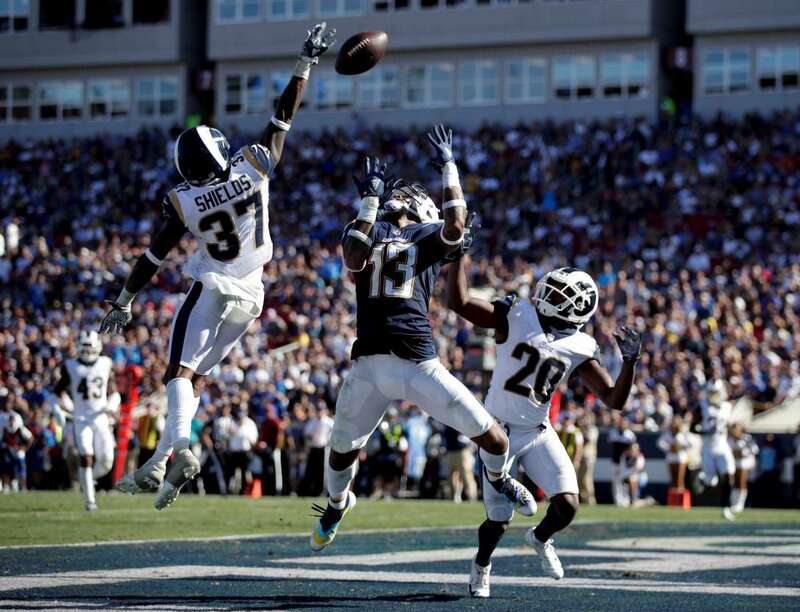 Pic of the Week: Los Angeles Rams cornerback Sam Shields (#37) breaks up a pass in the end zone intended for Los Angeles Chargers receiver Keenan Allen on Sunday. The Rams won 35-23.